Michael Cahill survived a heart attack three weeks before the shootings at Fort Hood, Texas. Family members say Cahill gave soldiers "best care that he could"
Cameron, Texas (CNN) -- Joleen Cahill had a gnawing feeling in her stomach. She was at work on Thursday afternoon when she heard a gunman opened fire at the Soldier Readiness Program at Fort Hood, Texas, the same place her husband, Michael Cahill, worked as a physician's assistant. Immediately, Joleen Cahill searched online to see if her husband was OK, but she found no answers. She went to her Cameron home, where she and a friend huddled around the television. "We were sitting at home agonizing," said Cahill's daughter Keely Vanacker. "We were calling every number, nobody could help, nobody could give us an answer." Cahill tried calling her husband. She got no answer. "I knew that he wouldn't be able to call us, and I knew just to wait," she said. "I kept hoping that no news was good news." She held onto hope on news that those who were killed were all soldiers, but at 11:15 that night, while she was on the phone with one of her daughters, there was a knock at the door. It was a military representative there to tell her that her husband had been killed in the attack -- the only civilian out of the 13 victims. Cahill, who works for a district attorney, said she knows that violence happens and can't always be stopped, but she never thought it would hit so close to home. "I just didn't expect it would happen there -- at Fort Hood," she said. Michael Cahill, 62, had worked for six years at Fort Hood as a physician's assistant, helping soldiers deploying and returning from overseas, after working as a rural doctor and serving in the National Guard and U.S. Army Reserves. He loved his job so much that he drove 60 miles in each direction to get to work each day. Three weeks ago, when Michael Cahill had a heart attack, he didn't want anyone to worry. He called his son from the ambulance on the way to the hospital, and didn't even mention it. Cahill left his daughter Kerry a message: "Yes it's a heart attack. Yes, I'm fine. Don't call until this afternoon, I'll be fine." A week later, he was back on the job. 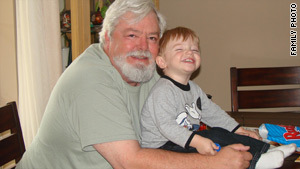 He wasn't the kind of person to sit at home and wallow over his heart attack, his family said. "He was ready, he had to go back to work," Kerry Cahill said. Family members said they know had he not been killed, he would have been trying to save the lives of others who were shot on Thursday. "He would have been right there, he would have done what he could," Kerry Cahill said. For Michael Cahill, work and family were his life. When he worked as a rural health care provider, he was on call 24 hours a day, his family said. And he would make time for every single person who called -- no matter what hour -- to try and help. "He did what he always thought was right. He supported his soldiers, he gave them the best care that he could give them," Joleen Cahill said. "Any of his patients, any of the health centers he was at, even when it meant putting his own career and his family's safety at risk. He stood up for people and said what he thought was right." Michael Cahill was also passionate about the health care debate, sending letters to legislators and writing messages online - all arguing for universal healthcare and a public option. James Cahill remembered his father as an intellectual man who read anything he could get his hands on and loved watching C-SPAN. "He was a very intellectual person just like me -- he was someone I could talk to more than anyone else," James Cahill said. He was so smart -- his daughters joked -- that they altered the rules to Trivial Pursuit to make him answer more questions because he would always win. The family chose to remember those memories, rather than focus on Maj. Nidal Hasan, the suspect in the shooting. "He's not the person I'm thinking about," Keely Vanacker said. "I'm thinking about my dad. He was a great person and it's going to be a great loss." Family members stressed, however, they hope there isn't a backlash against Muslims because of the attack. It was one man's decision to unload his weapons, they said, and a larger group certainly shouldn't be held responsible. "Being so angry at one group of people -- that's not going to bring my dad back," Keely Vanacker said. Kerry Cahill, still wearing her father's plaid shirt that she just couldn't take off yet, became emotional when asked what she would miss most about her father. "What would you miss if your dad died?" she asked before pausing, as if to give time to think of all of the memories anyone might have of their father. "I'll miss that."